React Native is a hybrid framework. To run on a device it depends on two (or even three) different runtimes simultaneously. The additional abstraction layer benefits productivity and cut development time, but it comes with a cost. When things go wrong, this added abstraction makes it much harder to understand the system state, and debugging much more complex. “Being a good citizen” is term often used by the Android framework team. As a developer, being dismissive about the amount of resources being used by your application is probably not a good idea. As the memory on a device is limited, the bigger the heap grows, the more aggressive the system gets in freeing up space for the foreground app, triggering garbage collection, killing other apps, and causing overall performance degradation of the device. Every usage of CPU, network and I/O, is less energy stored in the battery. being that good citizen means that you, the developer, should know and understand how your application performs, not just in terms of UI smoothness, that’s just a tiny part of the picture. React Native is a hybrid creature, running on two realms on iOS (JScore virtual machine for JS, and native runtime for ObjC/swift) and three realms on Android (JSCore, Android runtime for java, and native runtime for C/C++). Each of these realms has its own isolated memory address space, on a different-ish heap. There is no single tool (yet) that understands all of them together, in order to get the whole picture we need to use multiple tools. This post is the first in a, hopefully, series of posts, dedicated to familiarizing with how React Native works, how it performs on certain conditions, and tools that can help a developer detecting issues. This communication between JS and native is asynchronous, and the queue handles messages as they arrive. Assuming that the JS thread is now busy, messages sent from the native context (touch events, network responses, etc. ), may be handled by the JS thread with big delays. For the purpose of this demonstration I forked the original Movies App Example, let’s have look. Note: debug builds of a react native application work entirely different from release builds, loading the JS bundle from the development machine via websocket (which actually leaks native threads and lots of memory :/), so for the sake of the demo, I will only use release builds. 1. Spam mqt_js which runs a heavy calculation on the JS thread, causing it to be unable to do anything else for 8000ms. 2. Spam bridge calls setTimeout (JS) which is being translated to an invocation of Timing.createTimer() (Native). This is being triggered multiple times in order to create very high traffic over the bridge. 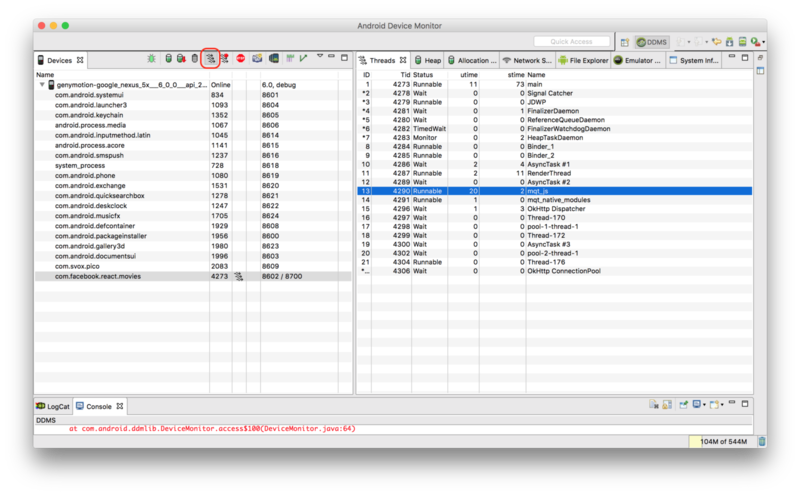 These screen recordings show the app running in an android emulator, and MessageQueue spy logs via adb. First, as a point of reference, this is how the app behaves normally. Running heavy calculations on the JS thread cause delays in callback handling, no messages are being passed through MessageQueue since the JS thread is too busy doing other stuff. utime - CPU time spent in user code, measured in clock ticks. stime - CPU time spent in kernel code, measured in clock ticks. Our point of reference, nothing funky, normal behavior. 2. mqt_native_moduels this thread runs the java invocations of all the native modules, and it is busy following the instructions and invoking createTimer() method in Timing.java. Excessive traffic over the bridge puts both JS and Native threads in overdrive. Being aware of the traffic handled by the MessageQueue is critical for the performance of your app. This is the first place I would go to when trying to debug issues, from network behavior to overall responsiveness, the spy function is very powerful tool! You can test all of this by yourself on the demo app mentioned above.